TechT L7 Bolt Upgrade for the DYE DAM! Finally...its here. The long awaited L7 Bolt for the Dye DAM! 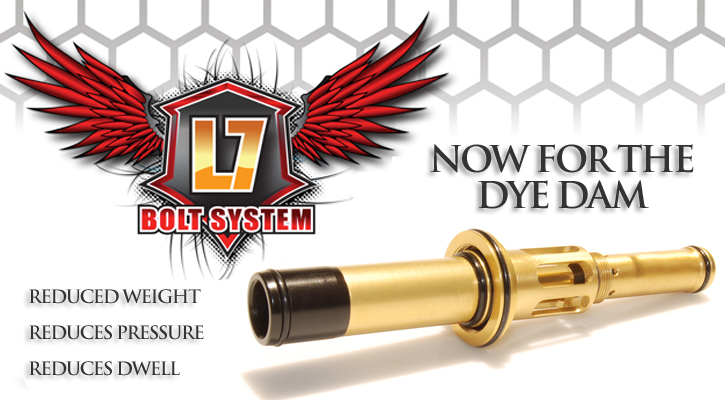 The TechT L7 Bolt System for the DYE DAM is a drop in replacement bolt upgrade that takes performance of your marker to the MAX! The L7 Bolt for the Dye DAM noticeably reduces kick/recoil because there is over 50% less weight moving as marker cycles during each shot. The reduction in weight makes the marker feel much smoother when it cycles and aids in improving long range accuracy. The enhanced L7 Bolt Head design also allows users to decrease the operating pressure of the marker to be softer on brittle paintballs. The modified derlin tip of the L7 is designed to improve performance and loading of all types paintballs and First Strike Rounds on standard mags and drum mags. Because the bolt is so much lighter than the stock bolt, it takes less force to move the L7 Bolt. This means you will be also reduce the dwell setting of the marker. This makes for faster cycle times, and yields increased air efficiency. Our testing showed an increase of 30 FPS when compared to the stock bolt. We removed the tail of the stock bolt, and gained volume inside the firing chamber. This gain in volume in the firing chamber allows users to reduce the operating pressure of the marker. 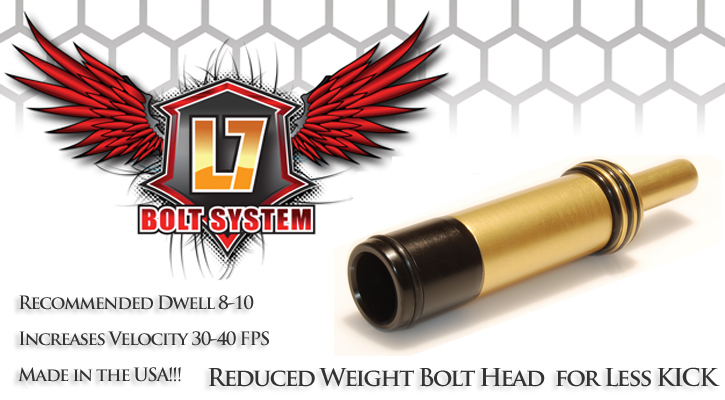 We chronographed the Stock Bolt to 290FPS, and then installed the L7 Bolt System. At same pressure the L7 Bolt shot an amazing 330-340 FPS!! That is an impressive jump in efficiency. Overall the L7 Bolt for the Dye DAM is an impressive upgrade for an impressive marker! Its makes the best, even better! 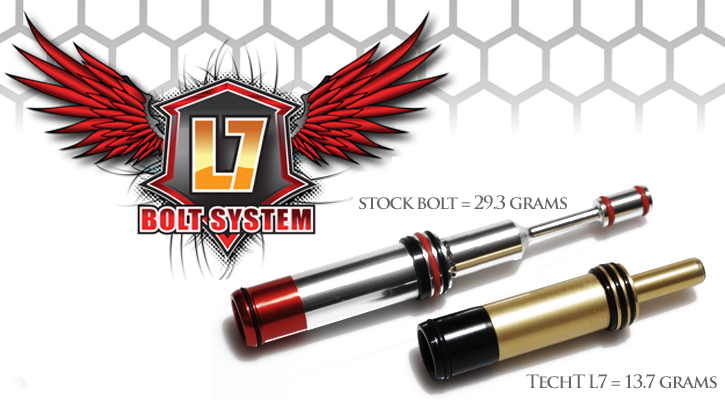 The L7 Bolt is 100% MADE IN AMERICA and comes with a LIFETIME TECHT Warranty. This is the o-ring kit you need for all of our L7 Bolts Inner Bolt Stops and Top Hats. This is the small oring that goes around the tail of all the L7 bolt series. This kit comes with 6 of the special orings you need for the L7 Bolt.